The Fellowship was fortunate enough to obtain a copy of PREDATOR: LIFE AND DEATH #1 from Dark Horse Comics. Dan Abnett writes, Brian Albert Thies draws, Rain Beredo colors, and Michael Heisler letters. The Company is concerned about some potential pirate activity on LV-797, also called Tartarus. So they politely asked the USCM to send a team out to investigate and persuade any perpetrators to leave their territory. The Colonial Marines agree, and their nearest team is led by Captain Paget. The scans show odd gaps in data from the surface, so they land without delay. But maybe Tartarus was a fitting name for this world after all. This issue begins a new maxi-series in the Predator universe, and it does not delay the action for any reason. And that’s really what we want in this universe. Oh, there’s a mystery here, of course, with a rival corporation and at least one survivor on the planet. But this issue moves quickly and gives us a taste of Predator-style action to whet our appetites. And the beautiful jungle setting and spaceship design whet them even more. You’ll have a ton of questions after reading this book, and that’s exactly as it should be. Abnett knows how to keep us coming back, that’s for sure. Get on board this one now. 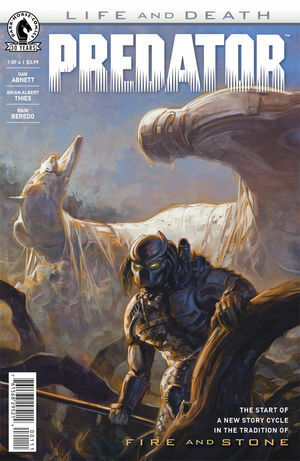 PREDATOR: LIFE AND DEATH #1 is available now at your FLCS or at darkhorse.com.